Discussion in 'Lexus Lounge' started by krew, Sep 15, 2017. Full pricing yet to be revealed. Den, CIF, Trexus and 4 others like this. gotta say, your fb live video made it look really really good, despite low quality... there is only so much you can see on pictures and video gave it completely different dimension. It looked sophisticated, smart and expensive. mikeavelli and Gecko like this. I am impressed with the price point. I was expecting this car to start around $85k and go up from there. With that said, I can see some people saying, "It's priced lower because of the V6, etc" so I hope the first drives negate any worries about it being down on power. CIF, mikeavelli and spwolf like this. The 1UR-FSE makes 386hp and 367lb-ft of torque, and the new TT V6 makes 416hp and 442lb-ft of torque. Theres no doubt that the new engine is more powerful on paper but what I'm more concerned with is NVH, smoothness and the power delivery because I think those things are pretty important to LS buyers. CIF, TripleL, John Strange and 1 other person like this. As we all expect, driveability should much better with tt, so it should end up a big plus with all the extra torque available from low revs... Even sound from latest user vids like one from this site os really good. Ian Schmidt, CIF, TripleL and 1 other person like this. This is a great starting price! it will sell better with this base price. I'm not worried about the TTV6, it will have plenty of power and the chassis has the high rigidity of the GAL platform that will make for much better driving that the LS460. I'm looking forward to hear about Krew's experience driving it. Based on what I've experienced with the LC500, it will have a great feel and handle superbly. I'm an optimist though. CIF, Gecko and spwolf like this. thanks Krew! very informative and, great job at reporting the facts sans evaluative emotion. BUT, I'm going to guess that you love this car! Great frontal pic of this car... Wish it well. Feel sure a higher powered version will become available either a V12 or V8 in due course, very competitive start price should do well. 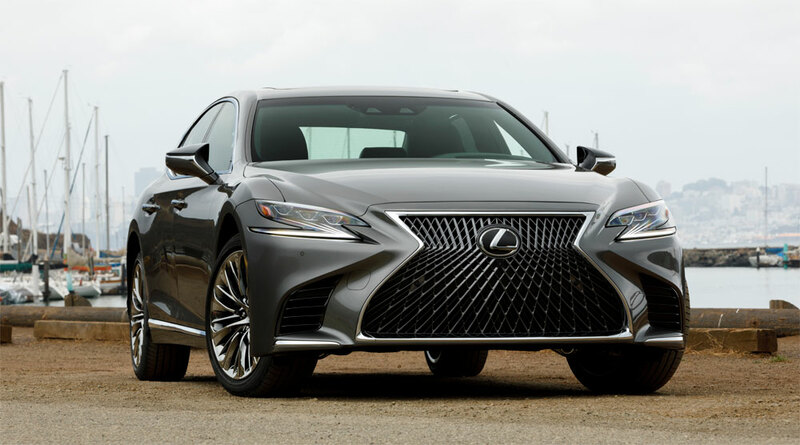 Would like to see Lexus bring in an even higher grade model to compete with Bentley and similar they have the expertise to do this very successfully. Come on Lexus move it up a gear! I don't really know enough to say this, but I feel like really wealthy people might want to pay a higher price. That starting price is a steal. Most will likely have . premium package of some sorts and be in the 85k range I assume... .Even 100k loaded what a steal consdering the S550 starts at 95k though you do get a standard V-8. PeterF, Trexus and CIF like this. An excellent price indeed, I truly expected the starting MSRP to be quite a bit higher. I think you have a point here... There is room to add more to this car be it power or simply more luxury, it already in my opinion makes the Germans look old hat and too conventionally mundane in appearance. F model should be quite more expensive than $100k and realistically thats a real limit for Lexus anyway. "Really wealthy" needs a quantitative definition. Maybach S or AMG S is maybe wealthy, but does not look more wealthy than base S. If being able to display wealth does not matter, so will the price of LS not matter. If displaying wealth does matter, any S is just too poor looking compared to Bentley or Rolls Royce. Another thing to take into consideration is that a sedan is not enough to display wealth, is must be a supercar, but being not enough practical, those are now SUVs (RR, Bentley, Levante, Rolls Royce, X7, GLS,...). More than that, wealthy people are not interested in displaying wealth to poor people, but to other wealthy people, so even if the LS was priced much higher, it still would not mean they would be more interested in it, if among them they do not even take Lexus into account. With the exception of "really wealthy people", most people drive cars way more expensive than their worth, a car, unless historical or limited, is always a cost, even if needed. bogglo and meth.ix like this. Some interesting points made in this post, not sure how Lexus stands in the minds of the general public outside of the USA - perhaps not quite up there in Europe etc however believe this car is special and could start a general move up the scale for Lexus. The historical element referred to is important e.g. names such as Bentley Rolls and even Jaguar conjour up ideas of grandeur and wealth more so than does Lexus. Work to do. maybe the LS-FC is the reason for the price of the LS500. At this point I'm not even sure TMC will actively push the FCV program any more. Hydrogen Economy is half dead at this point and will not be revived until at least the 2030s, I believe. Given the Mirai's status it's likely TMC will shelve LS-FC and use the 2020 time window to debut a BEV LS instead. They were reluctant to admit the FCV program was a failure back in 2016, but clearly the resources are now focused on BEVs. It makes a lot of sense since a car of this size can pack huge amount of battery (easily north of 150 kWh with solid-state for a 400+mi range). Lexus needs a high profile BEV launch in 2020, and LS can't be more appropriate for this event. The Japanese government is still sinking money into Hydrogen Economy; if I were a tax payer in Japan I would be absolutely outraged by such unrestricted spending given how bad the debt already is. There's no stopping TMC from using that subsidy to keep developing FC technology for when the time finally comes, but wide-spread production is unlikely out of Japan. US/EU/China is all about BEV right now. Levi and meth.ix like this. i doubt their FCV is going anywhere, which does not mean that they are not pushing EVs for the future too. They just dont need to lose money on them just yet.